Made from durable high impact acrylic. 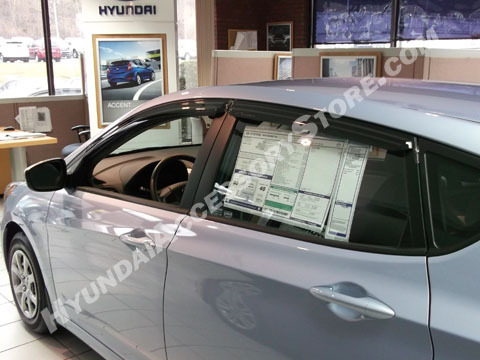 Custom fit for your new Elantra Touring. Made of reinforced acrylic in dark smoke grey, the Vent Visor keeps rain out and lets fresh air in. Vent Visors also reduce heat buildup in parked cars by allowing windows to be kept partially open. These vent visors are installed using 2-way tape on the outside of the doors vice inside the window track. It's a good custom fit, they look good, and function as advertised. The 2-way tape seems to stick well and should hold up under adverse weather.